I write to officially inform you all that I am resigning my position on the board, effective immediately. My primary concern is—as always—our students’ education. I have grave concerns about the actions taken at last week’s attempt at the transitional board meeting. I do not see how it is possible to serve our students, and to continue to be in full compliance with the law. As before, please feel free to contact me with any questions, and if I can find answers, I will. 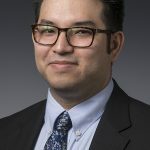 The Spring 2019 Landmark College Academic Speaker Series continues with a talk by Marcos Del Hierro, entitled “The Use of Hip-hop Rhetoric to Combat the Criminalization of Black, Brown, and Red Youth” on Tuesday, March 5, at 7 p.m. in the Brooks M. O’Brien Auditorium, located in the East Academic Building. During the talk, Del Hierro will provide insights into how hip-hoppers produce sustainable models for recycling knowledge and technology to produce art, criticism, and pleasure, allowing these artists to respond to social discourses that represent young people of color as inferior and deviant. Greetings, Brattleboro! My name is Jill Stahl Tyler, and while I am the chair of the Brattleboro Town School Board, I send this information out personally. It’s a broad update on the status of our budget/Act 46/delays in moving forward. Our Brattleboro Town School Board has always tried to “prepare for every eventuality” while going through almost four years of Act 46 discussion. In the hopes that you will feel more informed about the process, I have gathered this information. Feel free to share widely! 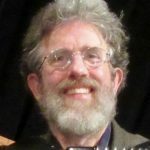 I am taking the time to clarify one thing about the choice voters face for the three-year seat on the Brattleboro Town School Board on Tuesday, March 5.
not be well served by the so-called “preferred merger” with a mega-board. After taking my seat on the Brattleboro Town School Board for the first time I took up as an early task the reading of the responsibilities of a school board member. Not surprisingly number one was to see to the education of the children. That suggested that I learn something about education. I remembered my father writing a paper on John Dewey in the 50’s when, after two and a half decades, he had the motivation to finish his Masters in education. So I read a teeny bit about Dewey, and a smattering of Piaget, Montessori, Bruner, Skinner and a few others. 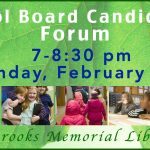 We are excited to host a Brattleboro Town School Board Candidates’ Forum on Monday, February 25th from 7-8:30 pm, downstairs in the Main reading Room! Prospective candidates include Emily Murphy Kaur, Jill Stahl Tyler, Spoon Agave, Andy Davis, and Robin Morgan. 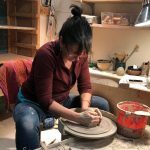 I have taught in Brattleboro public schools for over 25 years. Our two children went to Brattleboro schools, BAMS and BUHS. Even though I retired from teaching in June of 2018 I continue to contribute to area schools and to speak out for quality public education. I am committed to promoting equal access to a quality education for children of all abilities. I have lived in this town for over 30 years and believe I have a sense of our community values… diversity, creativity, compassion, sustainability. Happy February! As a member of the Brattleboro Town School Board since 2011, I’ve seen first-hand the extraordinary work done by dedicated professionals. I’m running to continue to ensure that excellence, particularly as we move towards a merged entity under the state-mandated Act 46. To comply with Act 46, I have led our board through reviewing all options, including the alternative governance plan. I could not support the alternative governance option because legal and financial experts had serious concerns of its legalities, particularly regarding sharing of staff. There are many ways of finding out the “Gematria” of a word,name or phrase. These different ways are called “ciphers”. They are all inter related. I will use the four base ciphers and the “S” exception. The English Ordinal is the alphabetic order. A=1 B=2 C=3..Z=26. Simply add the numbers together to find the Gematria of a word. The word “Fox” for example. F is the 6th letter, O is the 15th and X is the 24th. Added up it equals 45. 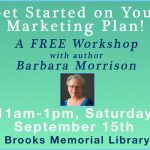 Join local author Barbara Morisson on Saturday, September 15th, from 11 am-1 pm for a FREE workshop, designed to help you learn how to strategize develop a marketing plan for your business! She will guide you through the questions necessary to solidify a basic plan, and discuss the pros and cons of the most effective marketing tools available today. The BUHS #6 Teacher Curriculum Committeewill meet at 6:00 p.m. on Monday, July 16in the WRCC Cusick Conference Room. The BUHS #6 Planning and Policy Committeewill meet at 6:30 p.m. on Monday, July 16in the WRCC Cusick Conference Room. The BUHS #6 Teacher Curriculum Committee will meet at 6:00 p.m. on Monday, June 4 in the WRCC Cusick Conference Room. The BUHS #6 Planning and Policy Committee will meet at 6:30 p.m. on Monday, June 4 in the WRCC Cusick Conference Room. the WRCC Cusick Conference Room. I saw this article the other day and had to laugh. Carmar Denim just announced the “extreme cut out jeans”. It sells for $168 and is of course sold out. $168 is 123 pounds in English currency. . This story was posted on 5/3 the 123rd day of the year. “Extreme cut out jeans”=247 in Reverse Ordinal (22+3+7+9+22+14+22=99(extreme) 24+6+7=37(cut) 12+6+7=25 (out) 17+22+26+13+8=86 (jeans)=247. 247 is 19 x 13. MARLBORO –Are you a landowner with a vernal pool on your property? Do you want to contribute to Citizen Science and learn more about the importance of vernal pools? 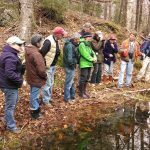 Get your feet wet with the workshop, Vermont Vernal Pool Monitoring Project and Vernal Pool Conservation for Landowners, co-sponsored by the Vermont Center for Ecostudies, the Vermont Woodlands Association, the Southern Vermont Natural History Museum, and the Hogback Mountain Conservation Area. The workshop will be held Sunday, May 13, from 12:30-3:30PM at the Southern Vermont Natural History Museum in Marlboro at the famous Hogback Summit. The BUHS #6 Board of Directors will meet at 7:00 p.m. on Monday, May 7, 2018in the WRCC Cusick Conference Room. The BUHS #6 Teacher Curriculum Committee will meet at 6:00 p.m. on Monday, April 23 in the WRCC Cusick Conference Room. The BUHS #6 Finance Committee will meet at 8:00 a.m. on Wednesday, April 25 in the WSESU James E. Kane Conference Room, 53 Green Street. The BUHS #6 Board of Directors will meet at 6:30 p.m. on Monday, April 23, 2018 in the WRCC Cusick Conference Room. I’m excited to report that the graduate program I work in at Marlboro College is going all online! I’m here for any questions or feedback. Here are the details and a press release. The curriculum has been updated to focus on human-centered learning experience design and increased student advising. The name of the program is now Master of Arts in Teaching: Learning Design and Technology. This is the standard name for most programs like this.